Saffron, Floor 52, Banyan Tree Hotel, 21/100 South Sathon Road, Sathon, Bangkok 10120, Thailand. +65 6849 5888 Thai cuisine. Open daily. Dinner 6pm-11pm. Bai Yun, Floor 60, Banyan Tree Hotel, 21/100 South Sathon Road, Sathon, Bangkok 10120, Thailand. +65 6849 5888 Chinese Cuisine. Open daily. Lunch 11.30am to 2.30pm. Dinner 6pm-11pm. Taihei, Floor 60, Banyan Tree Hotel, 21/100 South Sathon Road, Thungmahamek, Sathon, Bangkok 10120, Thailand. +65 6849 5888 Japanese cuisine. Open daily except Monday. Lunch 11.30am-2.30pm. Dinner 6pm-11pm. Park Society Restaurant and Bar, Hotel Sofitel So, 2 North Sathorn Road, Bangrak, Bangkok 10500. +66 2624 0000 Chic rooftop restaurant and bar. Also an exclusive area, HI-SO, offers moonlit cabanas with a glittering city view by night. 5pm–1am for bars and snacks. 6pm–10.30pm for dinner. Near Lumpini Park. Mezzaluna Restaurant, Floor 65, The Dome at Lebua Hotel, State Tower, 1055/42 Silom Rd, Bangkok 10500. +66 2624 9555. 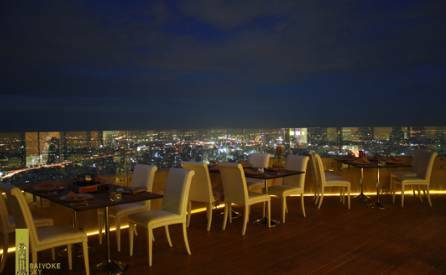 Breeze Rooftop Restaurant, Floor 52, The Dome at Lebua Hotel, State Tower, 1055/42 Silom Rd, Bangkok 10500. +66 2624 9555. Daily from 6pm-1am (last orders at 11.30pm for food). Offers open air seating as well as indoor seating. 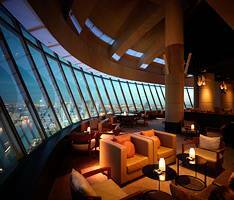 Distil, 64th floor, The Dome at Lebua Hotel, State Tower,1055 Silom Road, Bangrak, Bangkok 10500. +66 2 624 9555 5pm-1am. Cloud 47, 47th floor, United Center Building, Silom, Bangkok, Thailand 10120. +66 91 889 9600 Located at the top of the United Center office tower, Right in the centre of popular Silom Road, just past the famous Patpong night market and evening entertainment zone. Scarlett Wine Bar & Restaurant, Floor 37, Pullman Bangkok Hotel G (Formerly Sofitel Bangkok Silom), 188 Silom Road, Bangrak, Bangkok 10500. +66 2238 1991 GPS : N 13° 43' 32.82'' E 100° 31' 33.22' Accor. Barley Bistro and Bar, 5-7 Silom Rd, Bangrak, Bangkok 10500. +66 8 7033 3919 A rooftop bar with Jazz music. 22 Kitchen & Bar, Floor 22, The Dusit Thani Hotel, 946 Rama IV Road, Bangkok 10500. +66 2 236 9999, ext. 2499. A graceful French restaurant, D'Sens' large windows allow guests to gaze out onto all the early evening activity of historical Lumpini Park and the hustle and bustle of Silom, Bangkok's city center. Eight excellent restaurants offering European, Japanese, Chinese, Vietnamese, and Thai cuisine. Ginger, 24th floor, Centara Grand at Central World, 999/99 Rama 1 Road, Pathumwan, Bangkok 10330. +66 2 769 1234. 11.30am-3pm. 6pm-11.30pm. UNO MAS, 54th floor, Centara Grand at Central World, 999/99 Rama 1 Road, Pathumwan, Bangkok 10330. +66 2 100 6255 Spanish. 4pm-1am. Lobby Lounge, Centara Grand at Central World, 999/99 Rama 1 Road, Pathumwan, Bangkok 10330. Blue Sky Bar, 24th floor, Centara Grand at Central Plaza Ladprao, 1695 Phaholyothin Road, Chatuchak, Bangkok 10900. +66 2 541 1234. 6pm-2am. 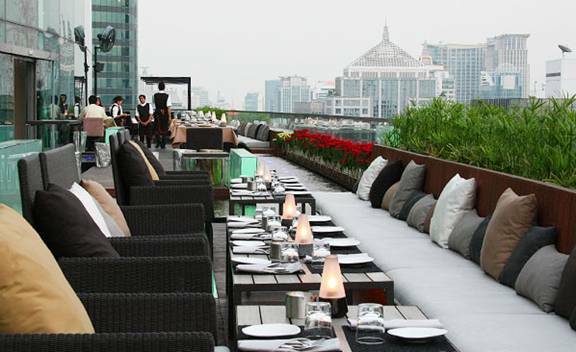 Rooftop restaurant adjacent to Central Lad Prao Mall and with easy access from Phaholyothin MRT station. Panoramic views across the Bangkok skyline and to the adjacent Chatuchak park and market. 6pm-12 midnight. 6pm- 2am. DMS Latitude & Longitude: +13° 49' 4.59", +100° 33' 36.04". email . Three Sixty Lounge, Floor 32, The Millennium Hilton, 123 Charoennakorn Road, Klongsan, Bangkok 10600. +66 2 442 2000. 6pm-2am. Sitting high up and chilling out to a little jazz provides the perfect setting to take in all of Bangkok. A relaxed, romantic setting with an extensive cocktail list, this jazz bar is quickly becoming a city favorite. Daily 5pm-1am. Rooftop Sky Terrace, atop 31st floor, The Millennium Hilton, 123 Charoennakorn Road, Klongsan, Bangkok 10600. +66 2 442 2000 Your own private picnic hamper and an atmospheric black and white movie on the projector make this a night to remember. Daily 5pm-1am. Above Eleven, 33rd floor, Frasier Suites Sukhumvit, Sukhumvit Soi 11, Klong Toey Nua, Wattana, Bangkok, Thailand, 10110. Overlooks nightlife hotspots. Men's bathroom lets diners relieve themselves while enjoying fantastic views of the city. More affordable than most. L'Appart bar and restaurant, Sofitel Bangkok Sukhumvit, 189 Sukhumvit Road Soi 13-15, Klongtoey Nua Wattana, Bangkok 10110. Rooftop. Luxurious outdoor terrace capturing panoramic views of the city skyline. Parisian style, modern design, stunning cocktails and gourmet accompaniments merge for an impressive atmosphere. amBar, Four Points by Sheraton, Sukhumvit 15, Bangkok. +66 2 309 3000 4pm-2am. Sit back on this rooftop, sip on one of their specialty cocktails, juices, or smoothies, and enjoy some live entertainment. The Long Table, Floor 25, 48 Column Bldg, 48 Sukhumvit Soi 16, Bangkok 10100. +66 2 302 2557 9. All visitors dine at one long table, touted as the longest dining table in the world. 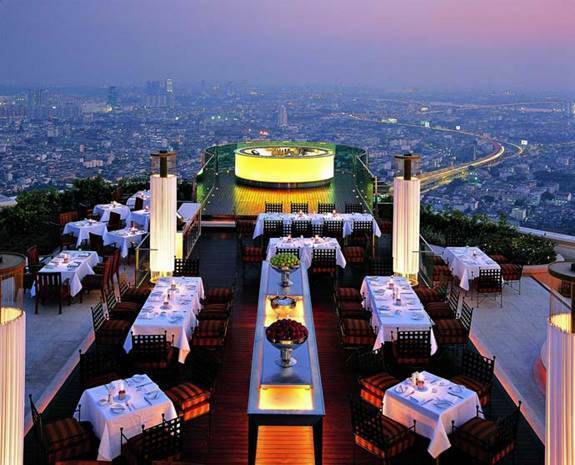 Sprawling roof top terrace gives excellent view over Bangkok's skyline. 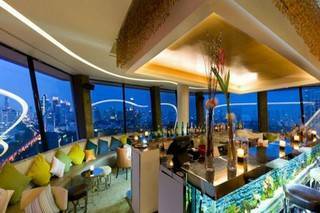 Zest Bar and Terrace, Westin Grande Sukhumvit Hotel, 259 Sukhumvit Road, Bangkok 10110, Thailand. +66 2 207 8000. Daily 6pm-2am. Panoramic rooftop views of Bangkok's sparkling lights. Rooftop Lounge, The Park Plaza Sukhumvit Hotel, Bangkok BTS Asoke Station, 16 Ratchadapisek Road, Klongtoey, Bangkok 10110, Thailand. + 66 2 263 5000 Rooftop drinks and snacks. Relax by the rooftop pool at Park Plaza Hotel Bangkok and order food and drinks from our a la carte menu. Enjoy gorgeous views of nearby Benjakitti Park and Bangkok's breathtaking skyline while you dine. Fusio, Floor 6, MINI building, 99/99 Sukhumvit 63 (Ekkamai), Kongton Nua, Wattana, Bangkok 10110. +66 2 711 6999. Daily 11.30am-2.30pm. Dinner from 6.30pm. Italian. Roof Hideaway, Muse Thonglor, 159/8 Thonglor Soi 10, Thonglor, Watthana District, Bangkok. +66 2 715 0998 Transport: Thonglor or Ekamai BTS then taxi. Daily 6pm-2am. Bands 7pm-2am nightly. Pranakorn Bar, 58/2 Soi Damnoen Klang Tai, Bangkok 10200. 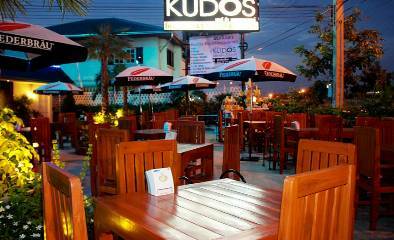 +66 2 622 0282 Close to Khaosan Road, this gallery-bar has a low-lit rooftop bar with views of the Golden Mount. Open daily 6pm-2am. Affordable. Stella Palace Rooftop Restaurant, Floor 79, Baiyoke Sky Hotel, 222 Rajprarop Rd 3, Rajthevee, Bangkok 10400. +66 2 656 3000. +66 2656 3456, ext 4. Daily 5.30pm-11pm. Sat & Sun lunch 11am-2pm. 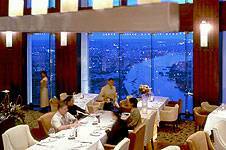 Crystal Grill, Floor 82, Baiyoke Sky Hotel, 222 Rajprarop Rd 3, Rajthevee, Bangkok 10400. +66 2 656 3000. 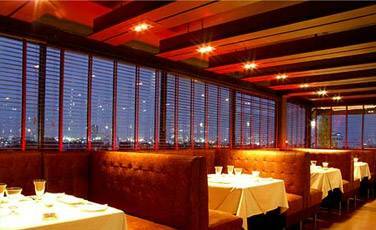 Enjoy a marvelous sky at night through the full height of the 5-meters window panes. The highest fine dining grilled & seafood buffet restaurant. Daily for dinner 5.30pm-11pm. River View Guest House, Floor 8, 768 Soi Panuangsri, Songwad Rd, Chinatown, Bangkok 10100. +66 2 234 5429. A great location overlooking the Chao Phraya river. Thai, International dishes and refreshments. Breakfast 7.30am-10.30am. Lunch 12 noon-3pm. Sunset drinks 4pm-6pm. Dinner 6pm-11pm. Siang Ping Loh, Floor 8, Grand China Princess Hotel, 215 Yaowarat Road, Samphantawong, Bangkok 10100, Thailand. +66 2224 9977. Daily lunch 11am-2.30pm. Dinner from 6pm-10.30pm. Revolving Restaurant and Club Lounge, Floor 25, Grand China Princess Hotel, 215 Yaowarat Road, Samphantawong, Bangkok 10100, Thailand. +66 2 224 7997. 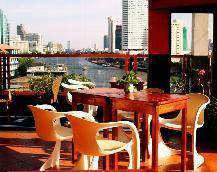 Panoramic rooftop views of the city and the Chao Praya River. Daily 5pm-1am. Right in the middle of Bangkok Chinatown's business district. Light snacks. Live music played every evening. Siang Ping Loh Chinese Restaurant, Floor 8, Grand China Princess Hotel, 215 Yaowarat Road, Samphantawong, Bangkok 10100. +66 2 224 9977. Chinatown. Daily for lunch 11am-2.30pm. Dinner 6pm-10.30pm. Panorama Restaurant, Floor 14, Mercure Chateau de Bangkok, 29 Soi Ruamrudee 1, Ploenchit Road, Patumwan, Lumpini, Bangkok 10330. 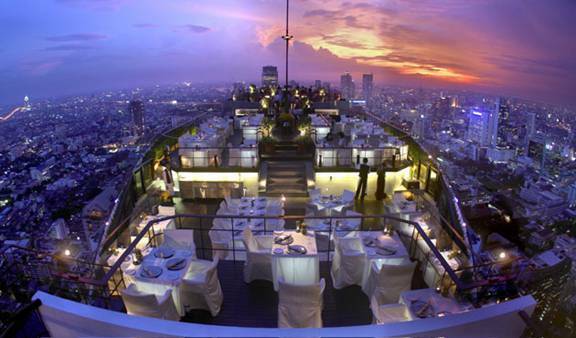 +66 2 651 4400 Featuring an open-air glass roof, the restaurant offers stunning views of the city of Bangkok. Daily 7am-12 midnight. The Speakeasy, 24-25th Floors, Hotel Muse, 55/555 Langsuan Road, Ploenchit Road, Lumpini, Pathumwan, Bangkok 10330. +66 2 630 4000 Daily 6pm-1am. Elements, 25th floor, The Okura Prestige Bangkok, 57 Wireless Road, Lumpini, Pathumwan, Bangkok 10330. +66 2 687 9000 Daily 6pm-10.30pm. ZENSE Gourmet Deck & Lounge Panorama, 17th floor, Zen World, Central World, Rajadamri Road (BTS Chidlom), Bangkok. +66 2 100 9898 Daily 5pm-1am.